Are you planning an industrial-chic affair? 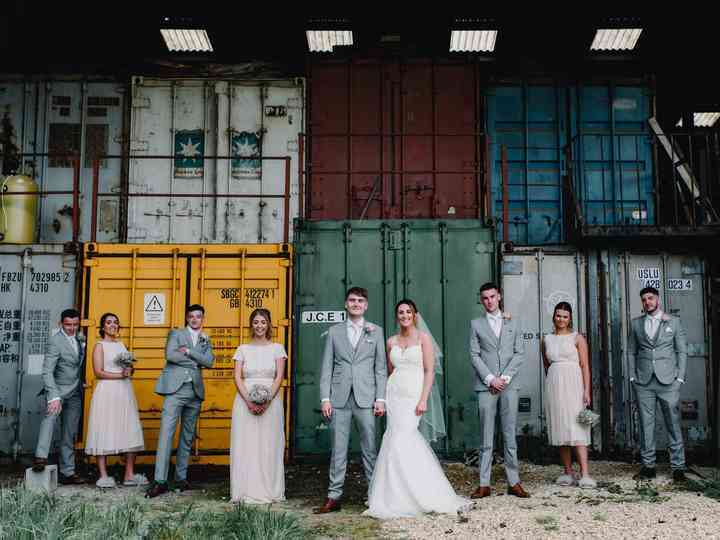 To help you out, we’ve rounded up a few of our favourite warehouse wedding ideas. Industrial-chic weddings are all the rage right now! If you’re hopping on the bandwagon, you’re probably in need of a few fun warehouse wedding ideas. From natural accents to industrial additions we’ve rounded up the best of the best from our vendors and real couples. Borrow one, two or all of them and you’re guaranteed to have a ‘grammable big day. Here are 16 steal-worthy warehouse wedding ideas. If you’ve chosen a warehouse wedding venue, you don’t want to go too industrial with your decor. Fill it with flowers and greenery to soften things up and add a little juxtaposition. Since your space is ultra modern and cool, your wedding stationery should match. Go for a more structured style with a geometric and simple (AKA not flowery) font. Sleek is the name of the game. Give your industrial wedding venue a bit of extra warmth by hanging strings of light across the walls and ceiling. P.S. Larger bulbs (like edison bulbs) are a touch better than traditional fairy lights thanks to their size. Contrast is key for warehouse weddings, so instead of asking your bridesmaids to sport uber modern cocktail dresses, put them in boho ensembles. Give your industrial ceremony space some cozy, homey vibes by adding vintage carpets to your aisle and altar. Warehouse venues are blank canvases that often require some extra TLC in the decor area. We suggest diving into DIY projects and adding fun details around your space, like these paper origami cranes (hang a thousand for good luck!). Your venue probably has a pretty neutral palette, so playing with pops of colour is a great warehouse wedding idea. Go bold and bright with your details, they’ll really stand out. If you’re a total minimalist, this is the style for you. Warehouse spaces are usually quite expansive, so you won’t be able to fill every nook and cranny with decor. Aim to keep things sweet, simple and refined. You want your wedding photos to show off your venue, so find a backdrop for your portraits that fits the bill. Anything with bricks, beams or worn down walls will do the trick. Opposites attract! Create a homey lounge outfitted with plush sofas, persian rugs and vases filled with flowers to contrast the edgy warehouse interior. You can also repurpose furniture from your flat (or use rentals) to amp up a dessert display, welcome table or lounge. One of our favourite warehouse wedding ideas is to go bold with large marquee lights! They’re retro, fun and are guaranteed to pack a punch against any weathered or brick wall. Old workshop ladders splattered with paint, crates and buckets will look right at home in your venue. Use them to display flowers, favours or food and drink. Geometric shapes go perfectly with a more modern wedding theme, so use them everywhere you can! While workbench-style tables would fit your venue style flawlessly, we suggest shaking things up and going with elegant tablescapes. Linen tablecloths and fancy dishware are unexpected and look awesome. A worn down venue looks amazing but a busted ride? Not so much. Book a vintage sports car so you can ride off into the sunset in style. Find more warehouse wedding ideas and inspiration in our Real Weddings section! Photo editing by Monica Lorraine and Diane Hall.